Could there be intelligent life in the star system KIC 8462852? A recent analysis of data collected by the Kepler space telescope has shown that this star, informally known as Tabby's Star, evidences aperiodic dimming of 20 percent and more. While several natural explanations for this strong change in luminosity have been proposed, one possibility is that a technologically adept civilization has built megastructures in orbit around star, causing the dimming. One example of a large-scale astroengineering project would be the construction of a so-called Dyson swarm of solar panels for large-scale energy collection. Other possible structures include artificial space habitats, or a planet-size or larger occulting object intended to provide a long-lasting signal to other galactic inhabitants. 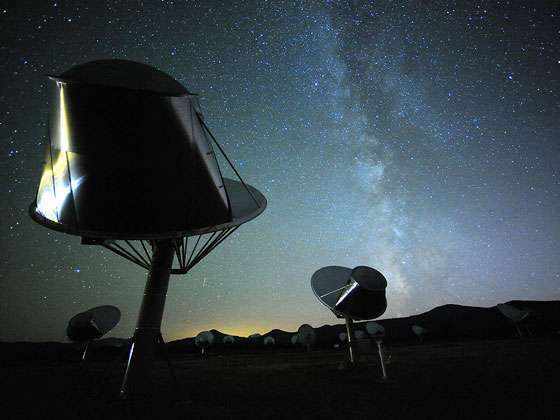 In order to investigate the possibility of a deliberate cause of KIC 8462852's unusual behavior, the SETI Institute has trained its Allen Telescope Array on this star for more than two weeks. The Array consists of 42 antennas, each 6 meters in size, and is located approximately 500 km north of San Francisco in the Cascade Mountains. Two different types of radio signals were sought: (1) Narrow-band signals, of order 1 Hz in width, such as would be generated as a "hailing signal" for societies wishing to announce their presence. This is the type of signal most frequently looked for by radio SETI experiments. (2) Broad-band signals that might be due to beamed propulsion within this star system. If astroengineering projects are really underway in the vicinity of KIC 8462852, one might reasonably expect the presence of spacecraft to service this activity. If these craft are propelled by intense microwave beams, some of that energy might manifest itself as broad-band radio leakage. "This is the first time we've used the Allen Telescope Array to look for relatively wide-band signals, a type of emission that is generally not considered in SETI searches," said SETI Institute scientist Gerry Harp. Analysis of the Array data show no clear evidence for either type of signal between the frequencies of 1 and 10 GHz. This rules out omnidirectional transmitters of approximately 100 times today's total terrestrial energy usage in the case of the narrow-band signals, and ten million times that usage for broad band emissions. While these limits are relatively high – a fact due primarily to the large distance (>1400 light-years) of KIC 8462852 – one should note the following: (1) The required transmitter power for the narrow-band signals could be reduced enormously if the signal is being deliberately beamed in our direction. (2) Microwave propulsion schemes would undoubtedly be beamed as well, and that would also reduce the minimum transmitter power necessary for detection by the Array. Finally, note that any society able to build a Dyson swarm would have access to energy at a level approaching 1027 watts. Even omnidirectional transmitters would be detectable if only a tiny percentage of this energy were used for signaling. "The history of astronomy tells us that every time we thought we had found a phenomenon due to the activities of extraterrestrials, we were wrong," notes Institute astronomer Seth Shostak. "But although it's quite likely that this star's strange behavior is due to nature, not aliens, it's only prudent to check such things out." Observations will continue, but so far no evidence of deliberately produced radio signals has been found in the direction of KIC 8462852. SETI looks for a Star Trek alien civilization but judging by what is going on here on earth all technology is a Krell machine producing silence because technology amplifies and weaponizes self destructive ideologies that become possible once predator intelligence controls its environment enough to accumulate wealth and leisure. This is exemplified by nuclear Islamic jihad and global warming, the nuclear weapon of progressive ideology's world conquest. We would not admit to alien communication, much less 'intelligence' even if the alien was there in the room standing directly in front of us...........speaking perfect English. WE probably would not recognize communication in many cases due to our cultural and religious prejudices, and political expediency.....or just plain because of our inability to escape from over structured thinking....sometimes misreferred to as 'stupidity'.